I am currently part-way through a full strip down and restoration of a 1989 EX-500. Everything came off, re-sprayed frame, re-sprayed or thoroughly cleaned pretty much everything else, and lots of it is back together. 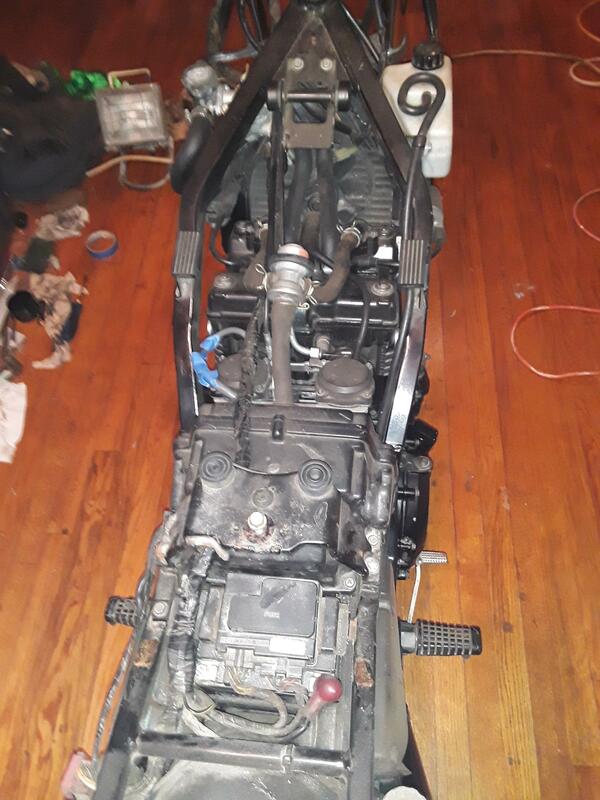 However, I am getting the wiring harness/loom back in, and can't figure how best to route it around the headstock area where it passes through one of the frame openings towards the headlamp/instruments. Does it go left, does it go right?! Can anyone shed any light on the matter, because despite taking hundreds of photos while dismantling, none of them seem to show what I should do here! Is it only the headlight connector and turn signal connector up front that your having problems with? I don't know if this will help or not. Bear in mind that we have 2 different generation bikes, but I think the routing is similar. Left hand side of my bike. 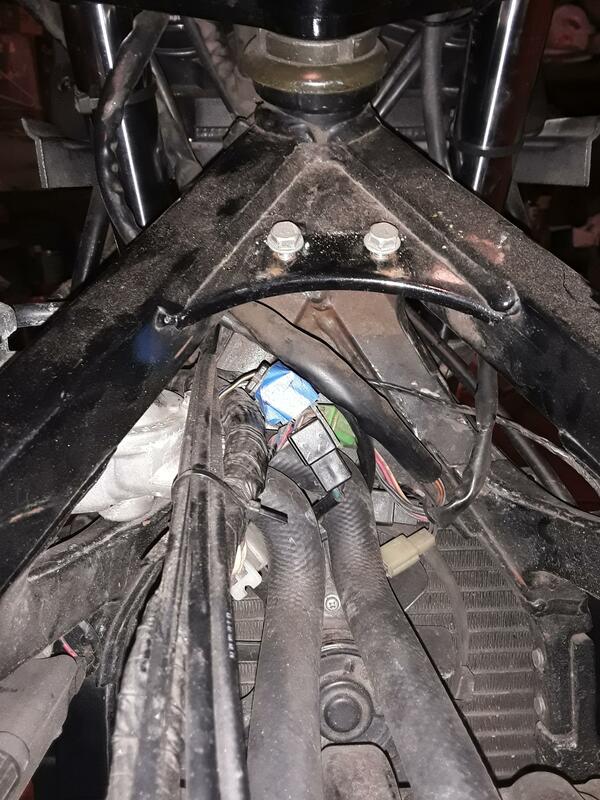 Thanks for the quick reply - the photo I think answers it, as it shows the cabling almost intertwined with the coolant pipes around the stat. 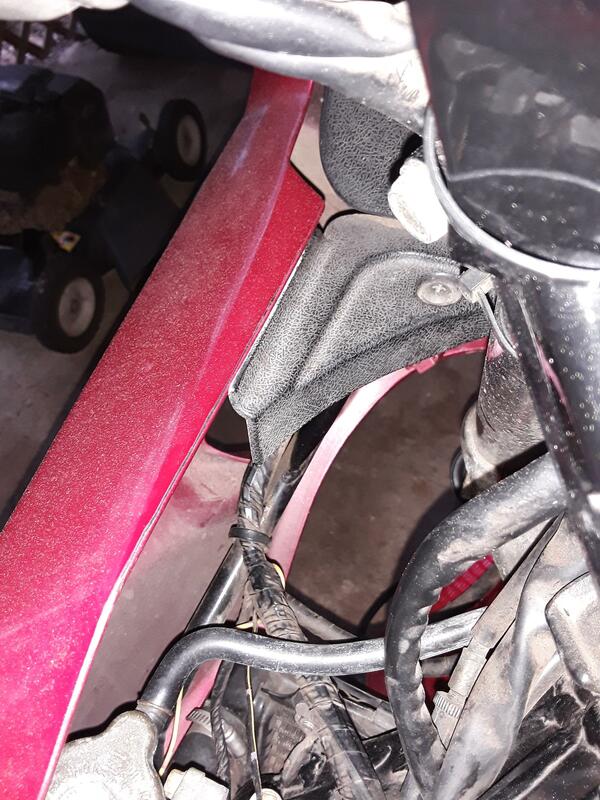 My ignition switch cable is fed to the right so that seems to naturally go right, but your photo seems to confirm what seems logical here, that everything else from the harness, i.e. left and right handlebar switches (horn, starter, lights, indicator, etc), headlight connectors, as well as connectors for coolant fan switch, sender, etc. all seem to go left. I'll go with that for now then! Any chance you could indicate where the control cables (choke and throttle) and the coolant reservoir overflow (really long!) run? The front turn signal connector once disconnected, half of it stays with the main fairing once removed. Throttle and choke cables zip tie to the wire harness at this point. You can kind of see how the coolant over flow routes here. spot on, many thanks. Will try and get out to the shed in the next couple of days and get it set up. hi, a couple of add on's for you. my choke cable goes down the right side while the throttle cables goes down the left. not sure why this is different unless it is to do with mine being a euro model but going down the right side does seem to be a more natural line for it. and the indicators wires in the harness terminate at a red connector. Just curious, is the choke lever on the Euro modals on the left? And does the choke plungers on the carbs move from right (off) to left (on)? yes that is correct. not sure why in this configuration the cable would go down the left side though. the leaver is close to the bars/forks so has to do a sharp U turn to go through the frame and a sort of S bend before it connects to the carb set, the cable mounting point is more or less centre of the engine so going down the right side the cable has a nice arc down through the frame and sit almost square on the carbs due to the metal elbow that sits in the carb bracket. ^ That was what I was thinking. Clearly you have a longer cable. Hi, thanks again for the extra replies. That will come in handy once I'm ready to set the cables up (which had better be soon, as I had the target to try and get the engine running by the end of March!). Sorry for lack of replies, I haven't figured out how to set up an email prompt when a thread gets a reply. no neither have I. mind you I get round that by actually login in and having a read. if I don't look I don't know. do I.
Ooh, get you yorkie :-P bpe had already kindly submitted some photos which answered my question, so I hadn't looked at this thread for a couple of weeks. Thanks to bpe and yorkie for your help.